The other day I came across this new year of the Horse greeting card and someone asked, “So how does a horse eat? Ehhhh”. This is an interesting question because the answer depends not on the horse but on how we think a beast should train. This is one of the curiosities of correlative thinking, which we use quite a lot in feng shui. 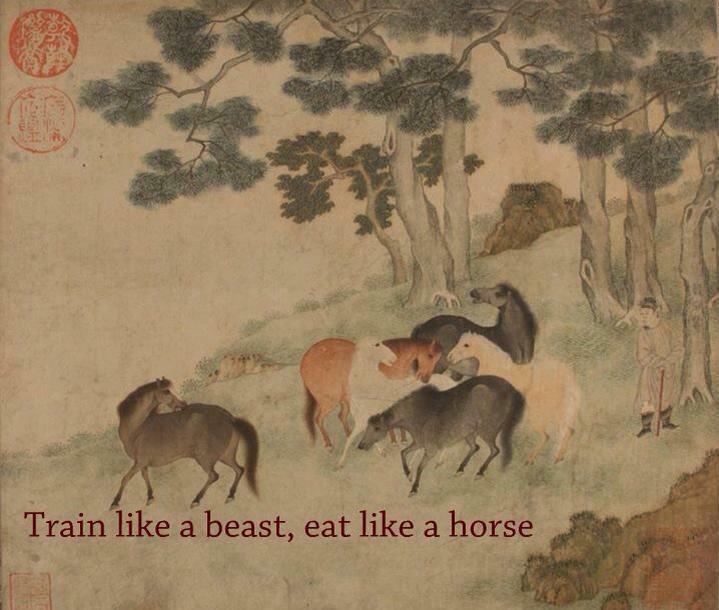 In the saying, “Train like a beast, eat like a horse”, the idea of training is matched with eating and a beast is matched with a horse, so if one thinks a beast should train fast and furiously then a horse should eat slow and leisurely. But if one thinks a beast is cruel and unrestrained, then conversely a horse is refined and restrained. We use these correlations not to find out how does a horse eat, but to investigate the relationships between these metaphors, so we can express more fully the appropriate behaviors for the year of the horse. In Flying Star feng shui we use a similar way of thinking, the water star representing wealth is matched with the mountain star representing health and the movement in the environment and in our activity (dong 動), is matched with stillness (jing 靜). 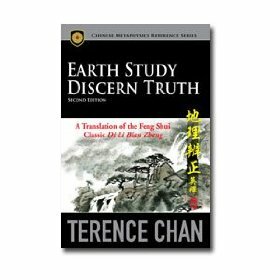 These correlations are not meant to tell us a cause or an outcome for wealth and health, but to guide us how to modify our environment and to behave in the most appropriate manner if our desire is for wealth or for health, and they mutually affect each other, like yin and yang complementing each other. Failure to appreciate that we are using a different way of thinking in Flying Star feng shui would lead to the misconception that we can foretell the future of our wealth and health with these numbers, whereas the aim is to use correlative thinking for us to understand the past and the present and then to do some forward planning to help us to achieve what we want out of life, represented by wealth and health. Enclosed are references to the books I mentioned. The author is Ulrich Wilhelm Lippelt. Enclosed is the back side of his second book, the table of content of both books, as well as his take on the use of color. Any idea where he got the idea, that color is the domain of wood? He is otherwise actually a pretty clever guy…. 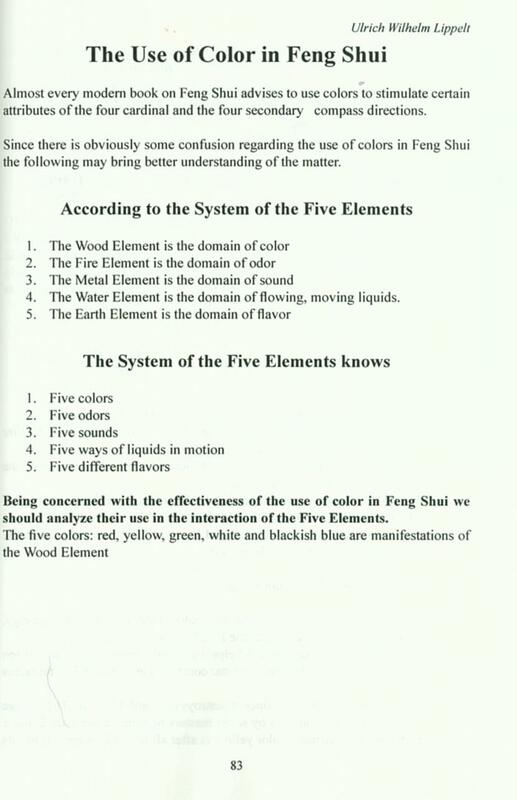 After reading Ulrich Lippelt’s 3 pages you sent me on the use of colours in Feng Shui, I have no idea where he got his idea from but I think he has mixed up his correlative thinking with the Wuxing (Five Elements) theories. 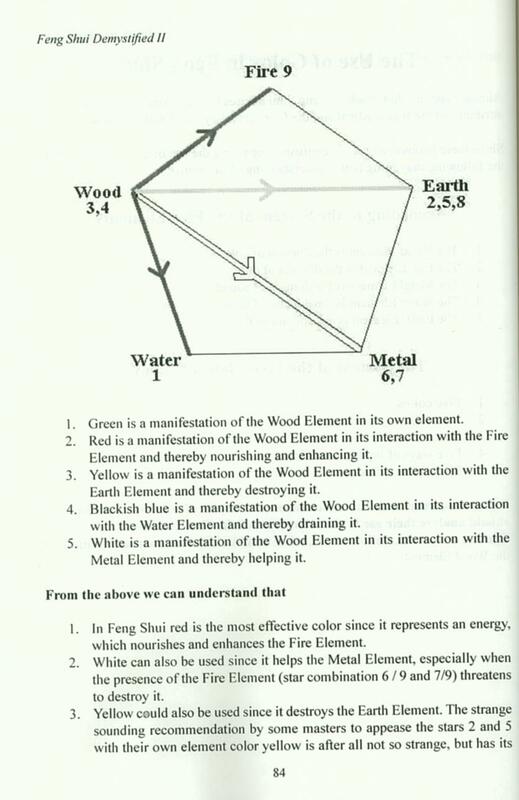 First he grouped colour, odour, flavour, sound and liquid into one grouping and then correlated the Five Elements to them, this I have never seen it done before in the Chinese classics, so his claim that colour is the domain of Wood is an unusual one. Then he extended this correlative grouping mentioned to another grouping (this time colours) using Wood as the linking Element, which makes no sense because they are two entirely different sets of correlations. It is like mixing up the correlation of the Earthly Heaven Bagua to the Luoshu numbers with the correlation of the Later Heaven Bagua to the Luoshu numbers, without knowing the same number doesn’t correlate to the same Trigram. He then used Wood/green as the reference point and came to the conclusion that red is the most effective colour and blackish blue should never be used (how rigid)! On the way he mixed in the correlation of the Luoshu numbers to the Five Elements and further muddled the water, by making 3,4 the determining numbers and completely ignored the idea that the five colours used in the correlation of the Purple-White Stars are not the same as the five colours correlations first mentioned in the “Spring and Autumn Manual of the Lu Clan” back in the Warring States period of China (475-221 BC). If we apply his way of thinking to the Five Flavours, then the sweet taste (Earth) is a manifestation of the Earth Element and then spicy (Metal) is the most effective flavour and bitterness (Fire) should never be used. One can carry this to its extremes by considering odour, sound and liquid in motion as well, and come to some similar ridiculous conclusions. This is quite a reversal in Chinese thinking, because correlative thinking is no longer relative, it became deterministic which is exactly what correlative thinking tries to avoid. Besides the use of colours in Feng Shui should not be considered only on the symbolic level (Heaven Qi) like the interaction of the Five Elements, but also needs to take into consideration of the effects of the Earth and Human Qi, such as the functional requirements and the psychological use of colours. The mistakes Mr Lippelt made are not uncommon with people who studied Feng Shui without understand the traditional way of thinking by the ancient Chinese. They mixed up the various correlations and take things too literally by mistaken correlative thinking with logical thinking, the result is they become quite deterministic rather than treating things in a relative manner in the process. 1. Correlative Thinking – in simple terms, thinking of an item of one class by correlating it with an item of another class – has been used to describe what is supposed to be ‘Chinese thinking’. My impression is that such thinking is also used in the study of magic (sympathetic magic) where a symbol of a thing is taken as having a relation with that thing e.g. ‘picture of tiger’ talisman with a tiger. 2. Aristotelian or Logical Thinking. Correlative Thinking has been criticized as being illogical in contrast to Aristotelian, Logical or rational thinking. However, there could be an argument that Correlative Thinking is a variation of (Edward De Bono’s) Lateral Thinking, a concept accepted by the West. 3. (What could be called) Dialectic Thinking. The ability to think of and accept diametrically opposing ideas at the same time, a form of thinking applied by some of the philosophers of Chinese communism, for example (yes, they also have philosophers!). 4. System thinking. To always think of any one thing as part of a system, rather than in isolation. What has this to do with metaphysics? 1. The ‘-physics’ part of ‘metaphysics’ has to be answered with Aristotelian or Logical Thinking. The scientific side. 2. The ‘meta-‘ (which means ‘beyond’) part of ‘metaphysics’ is dealt with through Correlative Thinking. The arts side. 3. The conflict between, and within, the two has comes within the scope of Dialectic Thinking. Any resolution of such conflict has to come through further theoretical research and empirical findings. 4. Bringing it together is System Thinking. I suggest that merely using one mode of thinking constrains progress in any field. “…We walked up and down in the snow, I on skis and she on foot. …and gradually the idea took shape… explained by Bohr’s idea that the nucleus is like a liquid drop; such a drop might elongate and divide itself… “ (source: Wikipedia). In other words, it was the idea of correlating the nucleus (of an atom) to a water drop (base component of snow) which helped progress their research.